Volunteers are needed at 3 upcoming fairs to promote Neighbor Ride. CarFit is a FREE interactive and educational program that teaches participants how to make their personal vehicles “fit” them to increase safety and mobility on the road. Review 12 key areas of your “fit” to your car, including adequate space from the steering wheel, proper seats belt use and properly adjusted head restraints. Each checkup takes approximately 20 minutes. This is not a driving test or a mechanical inspection. 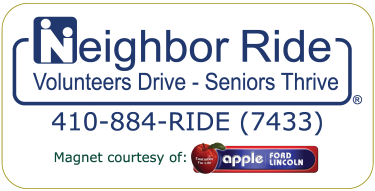 Call 410-8847433 or email volunteer@neighborride.org to register. "I am so very happy to have this service available to me. It has truly been a blessing to me. Everyone is so very pleasant. I pray one day that I can make a larger donation with my money and my time." "I am sharing my very positive experience with all my friends. How lucky I am to be able to use Neighbor Ride." Please refer your friends & neighbors! Saturday, May 4 BINGO DAY! Games begin at 7:00 pm.